We decided to celebrate my birthday last December by having a staycation in Shangri-La at the Fort. One of the reasons why I chose this hotel was to check out Adventure Zone. 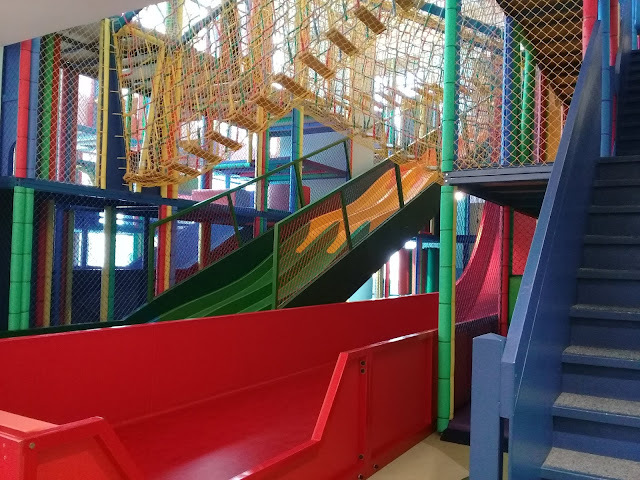 Adventure Zone is a 1000-square meter indoor playground inside Shangri-la at the Fort that I thought Henry might enjoy. And, I was right! As soon as we got there, his eyes sparkled with excitement. It’s a great place for toddlers, big kids and even for parents. There’s a small play gym and slides for the little ones. And, an even BIGGER one for the big kids. Their slides are not for the faint of heart as they are up to 18 and 24 feet tall, 2 of which are vertical drops. You may have seen them on my IG stories last month if you follow me on Instagram. They looked so fun that they might help you get over your fear of heights. Even some parents took their turns down the slides. 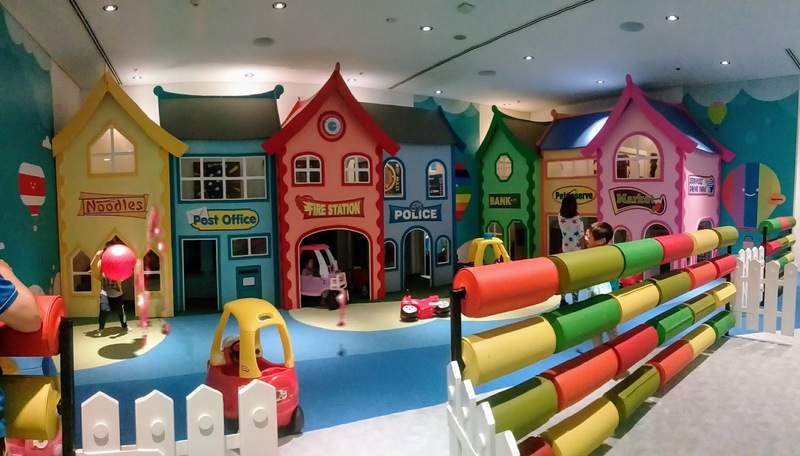 A small hidden village which encourages pretend play is also available. Henry think he’s too old for it though. They have three party rooms. 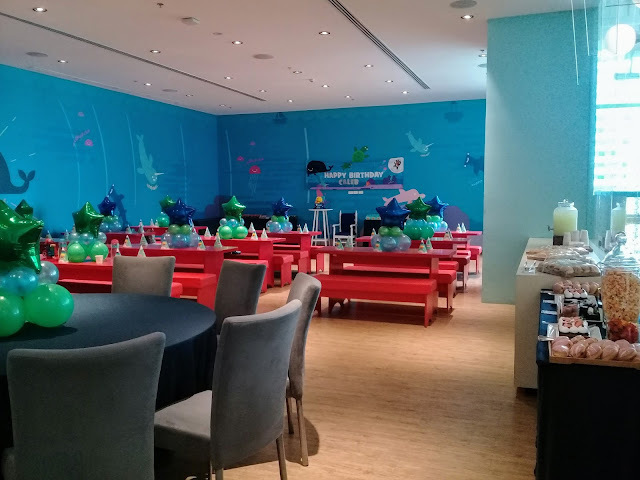 I got lucky and had the chance to take a shot of this room before a birthday party began. It's not just a playground and a party place. There are different scheduled activities for every day of the week which includes wushu classes for kids. Adventure Zone is a place that everyone would enjoy. It is for kids of all sizes and those kids at heart. 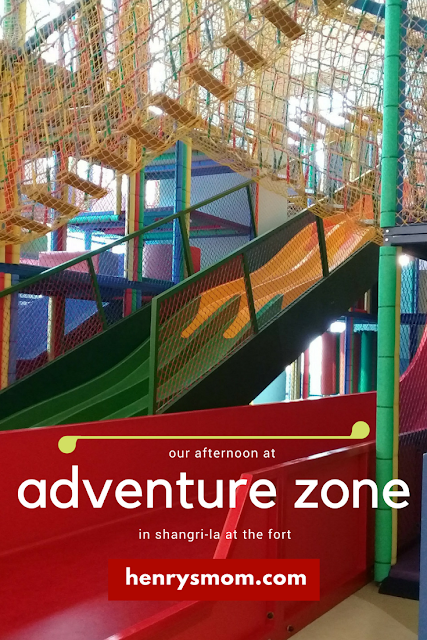 Adventure Zone is exclusively for Kerry Sports Manila members and guests of Shangri-la at the Fort. If you are looking for a place to go on your next family staycation then I would recommend this hotel. The exclusive access to Adventure Zone is worth it. Mukhang maganda nga jan! For sure mag eenjoy mga anak ko kasi mahilig sila sa mga slides. Affordable ba mommy per night sa staycation? Sayang kasi they were fully booked when we checked in kaya we had no option but to have regular booking lang. I also like to try this hotel because of this Adventure Zone. We tried their other branches in Makati and EDSA pero wala silang play area. I'm sure my son will enjoy the slides. This looks like real fun. I like the small hidden village. You're right when you described it as a perfect place to encourage pretend play. Adventure zone looks like more of Fun Ranch. The kids will surely love to go there! but I don’t like when big kids mixed with toddlers kasi kawawa yung maliit. The big ones were too excited to be atleast extra careful with little ones. My hubby works super near there but we haven't booked a stay there yet. I'm sure my kids will love it there. Must check it out asap! I'm sure your kids will enjoy it. You should try their stay and play package. 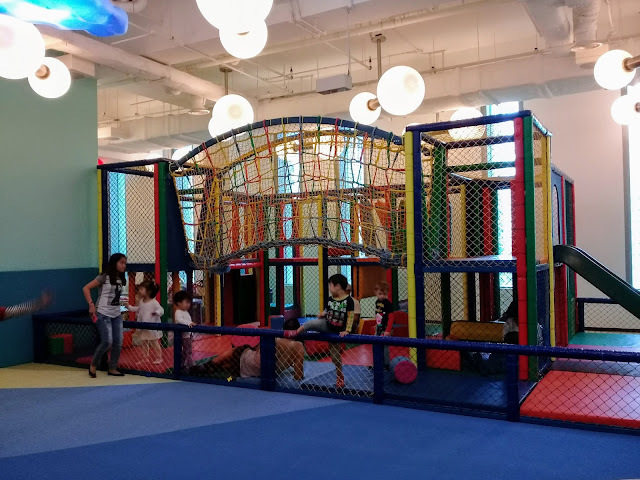 I wrote about the slides at Active Fun in BGC and I remember saying the same thing -- it's not for the faint of heart. But of course my kids were very young then. I still follow Henry around. I think he gets annoyed by it sometimes. Especially when we are at Kidzania. My kids would surely love it there! Playplaces at Shangri-la Hotels are really nice. Looks fun! Gymboree lang ang meron when my child was growing up though. I'm sure your son had a blast. Nice slides! Even parents will enjoy trying those slides. Are they allowed or kids lang? Parents are allowed to go down the slide too. I tried to, but I got scared. haha. Haven't been to Adventure Zone but heard from friends that they greatly enjoyed bringing their kids there. Will check it out soon!